Leading Exporter of pembrolizumab injection from Mumbai. KEYTRUDA is a prescription medicine to treat a kind of lung cancer called non–small cell lung cancer. 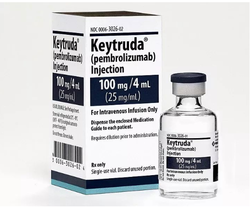 KEYTRUDA may be used when your lung cancer has spread and tests positive for "PD-L1" and you have tried chemotherapy that contains platinum, and it did not work or is no longer working and if your tumor has an abnormal "EGFR" or "ALK" gene*, and you have also tried an EGFR or ALK inhibitor medicine. It is not known if KEYTRUDA is safe and effective in children less than 18 years of age. Looking for Pembrolizumab Injection ?